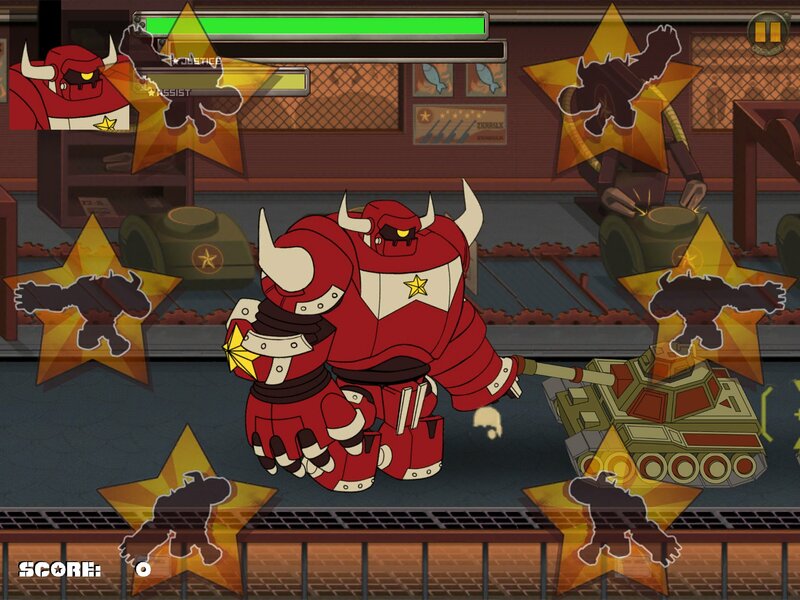 Warbot Assault (Free) is yet another Kongregate-published free-to-play game. The concept is certainly an exciting one: players outfit a giant robot and an army of vehicles, and take them into battle against other armies of vehicles, and another giant robot. These opponents are all based on other players’ loadouts, so not only is it possible to punch a giant robot to death, it’s possible to punch a giant robot to death, and have someone in the world know that it was their giant robot that got punched to death by you. Unfortunately, that’s it for the game. It does little to add much variety beyond “punch giant robots in the face." The missions are largely the same, just picking from the current set of opponents, fighting them and collecting winnings. Said winnings are spent on item crates for new parts and vehicles, which can then be fused with other parts and vehicles to collect more experience. Continue until out of energy and/or thoroughly entertained. The controls involve tapping in top, middle, or bottom sections of the screen on each side to attack at that height and direction, with tapping and holding to block. Down swipes are used to call in assists, which function a lot like the partners in Marvel vs. Capcom 2: they can be used an unlimited amount of times, but with a short recharge between each one. Even just for the nostalgia, it’s a pretty cool system. The controls are overall a great fit for the combat: just tap frantically, occasionally block whenever an exclamation point on an enemy comes up, and all is golden. There’s MFi gamepad support, but honestly? I liked using the touchscreen better for the pace of the game. The game’s art winds up conflicting with that pace of the game: the basic enemy defenses are the same as the assists, so it’s easy when regularly calling them in to get confused as to which is which. I would appreciate some pallete swaps to at least differentiate between player characters and the enemies, particularly the boss robots. As time goes on, and different parts with new looks get equipped, the robots start to look different, but up until then, it makes the game look cheap. And the UI just has a general feeling of crudeness that just makes this feel like maybe there was a little more time meant to be spent on making the game look good. As far as the monetization goes, it works like a card game: parts and vehicles are earned through crates, with common ones that can be randomly collected or bought with soft currency, silver coins. The premium crates cost hard currency, gold coins, which can also be spent on continues, energy refills, and silver. And yes, there is an energy system to fight battles. Parts and defenses can be upgraded by fusing them with other parts to earn experience points – at a cost of silver. It’s all a rather familiar system. The issue I take with it is that the cheapest IAP for gold is $4.99 – I’d be interested in a $0.99 or $1.99 IAP for a small amount, to try out the premium crates, but such an option does not exist, and likely prevented me from spending any money at all. 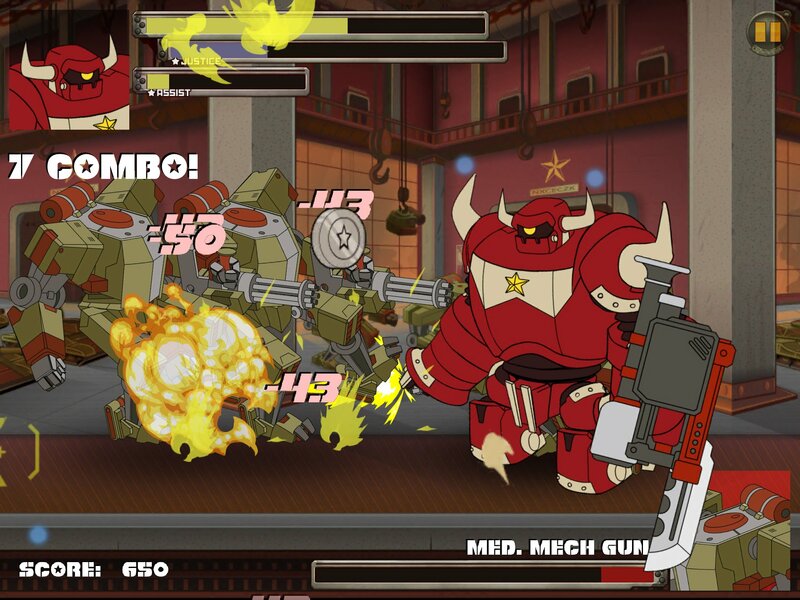 I think Warbot Assault is perhaps interesting to check out for its ‘giant robots punching others in the face’ premise. It’s just not one with much lasting appeal beyond that. More variety in game modes, and more customization, both of look, and maybe even of the levels that opponents have to fight in, would go a long way toward making this last a lot longer. Otherwise, Endless Boss Fight (Free) does a much better job at delivering on the general concept of this game, and expanding on its myriad elements.